In the same way graduation is referred to as commencement, this is the commencement of the journey to finding your career. It’s a start. A beginning. Even though this might be the last time we meet in person, think of it as the launch pad to your future that begins with us and ends with you in a deeply satisfying and well aligned career. Career exploration and research is important because sometimes a career may sound really good, but it isn’t that great in real life. After some additional exploration you’ll be able to make a better, more informed decision. 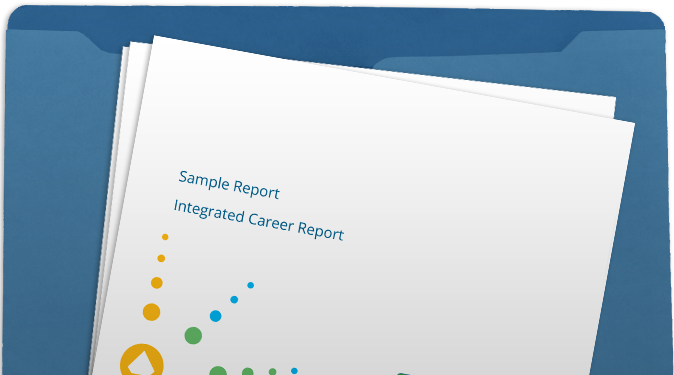 Our Integrated Career Report is both extensive and easy to understand. After we review it together in collaborative dialogue, you’ll be equipped with a meaningful list of interesting, viable careers to research and consider more deeply. Your custom report includes 5-10 career clusters that closely match your strengths and interests. Within each cluster, we identify 6-8 occupations—that’s over 50 viable career options! We’ll review and narrow down to a focused list only for you. And you’ll appreciate the clarity it provides.